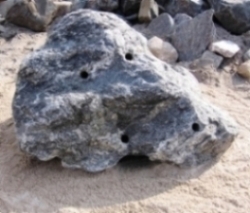 Below is a small sample of the Decorative Dive Rocks, Pool Rocks, Grotto Rocks, and Accent Boulders that Skyview Stone offers for Your Landscape, Waterfalls or Swimming Pools on Long Island, NY, as well as other States. We offer delivery of all products that we have in our yard or direct from the Mountain. You can purchase as little as one yard or one ton. We can also arrange for large loads, such as a 10 wheeler truck load or tractor trailer, which will be at a big savings for you! As always, Skyview Stone will load your dump truck or trailer . Diving Rocks come in different sizes, shapes, and colors. How about a cascading Waterfall running down to your cool clear pool ? 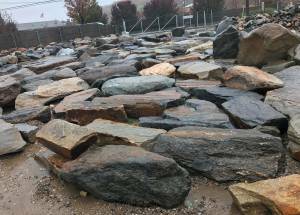 Skyview Stone & Land Development - sells Diving, Pool Rocks & Boulders in many different Shape, Sizes & Colors from LI, NY, Connecticut, NJ, PA, Massachusetts & Maryland. Each is All Natural & Unique with it's own Character Qualities. Choose the right rocks to make your wishs come true ! 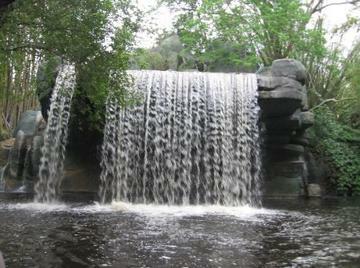 Cascading Mountain Waterfall, a nice Ribbon of Cool Refreshing Water to relax and re-energize you !! Diving Rocks made from Manhattan Bedrock have Character & Texture, charcoal grey to black in color with sparkle from the mica. 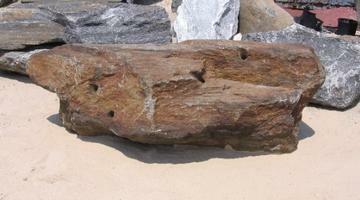 Some have brown coloring as well from the iron deposits. Each is unique and one of a kind! How about setting this flat rock up high at the edge of your pool, as a diving rock or have a ribbon of water cascading off the edge of a cave into your pool! 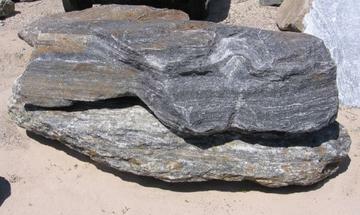 This beautiful Rock (5050 lbs.) will be a great addition to your Swimming Pool area, when you hookup water to the predrilled holes. How about small water cannons to jet water up and into your pool to music, like at Disney. This Rock can be used as a diving rock or just a pool rock to sit on and relax with a good book or a frosty Pina Colada, it might wisk you away to the Caribbean! Natural in color yet beautiful in design, this rock is definitely one of a kind. Imagine...... diving off a Rock so divine, or have a seat just to unwind. To use as a Stepping Stone under a Cascading Waterfall or by the Swimming Pool with its natural glitter its sure to sparkle for you. This rock weighs just over 3800 lbs. Accent your pool with some color. Liven it up with pink, green, red, gray, black or white, so much to choose from you have to stop in and see which you like. Colors are more vibrant in the shining sun, and sooo many sizes that you cant choose just one. Pool Rocks come in many shapes and sizes, measure the area near you pool, then come down or email the size and color you are looking for. These colors and many more we carry in small stone sizes. Beautiful Mountain Waterfall Cascading down off this Rock Ledge ! Don't you want to slip into this lake to cool off ! Grotto Rocks and Cave Rocks can make your pool area beautiful and relaxing. How about a smaller version in your own backyard, to relax in after your long day at work ? This Manhattan Granite Waterfall Accent Rock would look nice next to a Swimming Pool, with water pulsating out of the predrilled holes and shooting up into the air and into your pool to the beat of the music! How about adding a light show as well? 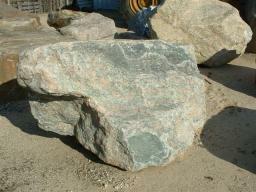 Riverdale Granite - This natural pink and green gem will brighten up your pool area and landscape. These rocks feature a gently textured surface and are great to sit on, use as dive rocks, or even in your personal relaxing waterfall. Stop in today to see the many shapes and sizes that are available. 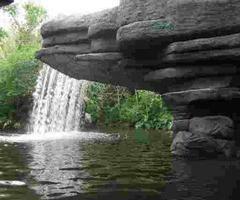 Awesome...... Manhattan Granite Waterfall Rocks accenting your Swimming Pool or Lake ! Choose from our Selection of Decorative Accent Rocks to "Rock Your World"
How about a nice Diving Rock to enter the cool water.... or the perfect rock to allow a ribbon of sparkling water cascade into your pool ! Here we have a White Limestone Rock surfing into the sunset on a 3,100 lb Manhattan Granite Rock all while maintaining balance on a Long Island Native Boulder. 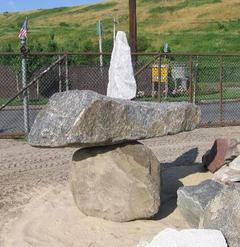 3 different rocks all balanced in harmony! 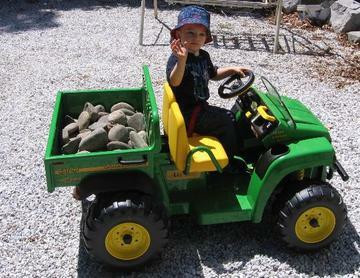 Hi Everybody it's me, " Clint ", I'm delivering another truckload of Landscape River Stone to my own backyard oasis ! Come on down to My Place.... called 'Skyview Stone' and find the landscape rock, stone or boulders you like for your house ! How many people survived with Noah on the "Ark" ? Who closed the Ark door ? How long was the Earth flooded more than 22 ft above the highest mountains ?